As Cadets step off the grass, their well-worn boots crush the gravel, the rocks popping and crackling beneath their feet. It’s early, but the determined looks on Cadet’s faces show a ‘just another day’ mentality mixed with the joy of being almost done with tactics training. Leading up to the march Cadets have completed three other parts of tactics training, consisting of tactical training base operations, squad situations exercises (STX) and patrolling. “It is a team building event and it’s physically challenging, particularly after two days of patrolling in which they have spent one night in a patrol base,” said Lopez. 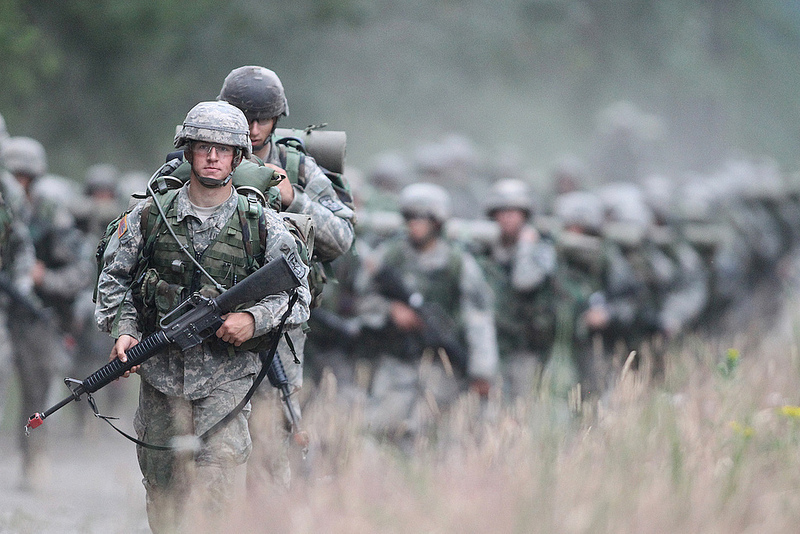 All of their tactics training has taken place in a fictional country called “Atropia” on Joint Base Lewis-McChord. The primary spoken language of Atropia is Spanish and the culture mimics that of the Middle East and South Asian countries. Atropia is populated by Atropian civilians and by the South Atropian People’s Army (SAPA), who cause terror in the region. The SAPA forces are the Cadets’ notional enemy. During STX lanes and patrolling, Cadets conduct missions deep within a forest full of SAPA forces. The concluding foot march is no different. “It’s a culminating event of operations in Atropia. It moves them to the vehicles that will take them out of country,” said Lopez. 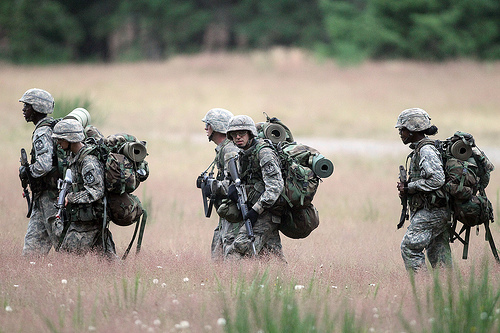 The 10k foot march isn’t just a matter of marching along dirt roads; it’s one last mission. The reason that Cadets must take this route is because SAPA forces have restricted the flow of traffic by creating illegal checkpoints and roadblocks. This route is the only one that has been secured for transportation purposes, said Lopez. “They have completed stability operations that have rendered the SAPA almost combat ineffective, yet there are still pockets of two to three SAPA Soldiers that continue to harass NATO forces,” said Lopez, explaining why Cadets need to stay alert along their winding journey. Traffic control points are manned along the route for both safety and security, said Lopez. First aid vehicles are stationed at every checkpoint in the event that someone’s ankle takes a wrong twist. Before the first checkpoint, Cadets march with a bounce in their step, boots raised high with each stride. Their faces look fresh; some are painted in camouflage and others have fern leaves stuck in their helmets like crowns. Decorating their faces and helmets lets each Cadet’s individuality shine, while also serving the functional purpose of making them appear less noticeable to the enemy. Cadets carry a ruck sack (backpack) holding approximately 35 pounds of gear with them during their march. The packs contain supplies such as extra food, a poncho, wet weather tops and bottoms, four extra t-shirts, under clothes and a sleeping bag. They also carry a weapon and are decked out in full combat uniform including helmet and load-bearing vest, also known as their “Battle-Rattle”. “The center of my back hurt the most, being hunched over with all the gear,” said Cadet Sabrina Sanchez from University of Texas – Pan American. Cadets of the 9th Regiment during the 10k foot march. U.S. Army photo by Jesse Beals. “The road march provides us the only collective physical fitness training event we have at Operation Warrior Forge. The APFT (Army Physical Fitness Test) is an individual event. This is a squad, platoon, and a regiment collective event,” said Lopez. As Cadets pass checkpoint two on the oak tree-lined road, they are halfway through their mission. Cadet Collin Cook from Colorado University said that his height helped him complete the march because he could take bigger strides. “It’s easy because I’m 6’4” and I’m built to ruck march compared to other people. But I was just worried about helping them get through,” said Cook. “There was a lot of motivation. We were determined to finish the way we started,” said Sanchez. As time passes some Cadet’s paces are in synch with others, while some have to double-time to keep up with their taller comrades. By 6:30 a.m. the morning haze is wearing off, and the roads get dirtier. Some of the Cadet’s bounding steps become slower in the grimy terrain. The crisp strides seemed to fade with the morning fog. The sunrise smolders away as the Cadets’ route brings them onto a dirt path parallel to a main road. The grass between the worn out foot trails is so dusty that is has turned from vibrant green to burnt yellow, like a median on the highway. The specks of dust kicked up on the dirt trail create a dreamlike atmosphere. Dust sticks to the Cadet’s sweat and patches of dirt collect on their faces. One Cadet asks the Cadet behind him if he can find the spout to his camelback as he lets out a cough. As they spill out onto another gravel road, their silhouettes fade into the dust cloud and they return to the forest once again. Cadre continue to yell out “Breathe in the nose, out the mouth!” and “I know no one is trying to drop out of this thing!” to keep their Soldiers on a steady pace to the finish line. After one last bend in the gravel road, Cadets see a white Titan Nissan 4×4 truck ahead, blocking their path. Is it a SAPA roadblock, or the finish line? Cadet’s are pleased to learn it is the latter. The first wave of tired Cadets cross the finish line at 7:03 a.m., satisfied with their achievement. Waiting by the truck stands regimental cadre Chris Chisholm, waving in and congratulating his Cadets. “It’s a good day to be almost graduated, Hooah!” yelled Chisholm to the panting Cadets. Amidst the cloud of dust swirling around the finish line, heavy breathing, laughter and cheers rise as more Cadets finish the march. One Cadet turns to his group and yells “Outstanding. It’s incredible what your mind can do!” as he takes the last dusty breaths over the finish line. As Alpha Company finishes, Bravo Company falls in right behind them. The companies split into separate formations, making sure every Cadet is accounted for. The Cadets have a brief break before they are bused back to their regimental barracks on the other side of base. “It was ok. I’m 31, so it was kind of tough keeping up with the younger ones but I did it. I stayed right in the middle,” said Cadet James Gantt from Georgia Southern University. “Although it’s not timed, it’s meant that everyone that begins finishes. It’s a team building event in that you start together and you finish together,” said Lopez. “It was a little rough. I started off in the front and I ended in the front, that was my goal. Being 4’10 ½” it can be a little difficult but team work was what got me through it,” said Sanchez.